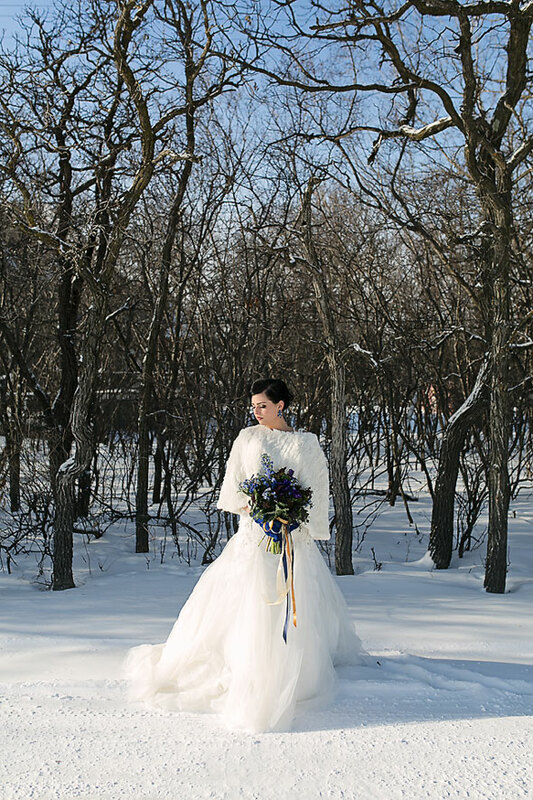 Winter is right around the corner and for all of those beautiful brides that are thinking of holding their wedding over the winter season, nothing could give better inspiration than this Winter Wedding Styled Photo Shoot! With the rich, deep blues contrasting perfectly with the whites and snow all around, it creates the perfect balance of elegance and beauty! 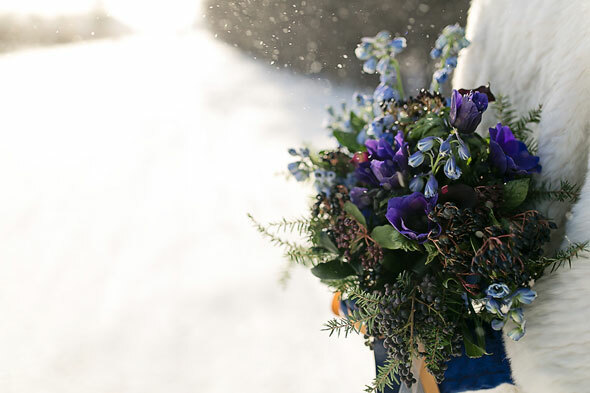 Colors for this winter wedding styled photo shoot at The Gates on Roblin were designed around the color palette of deep, vibrant blue, purples, marsala, ice blue and gold. 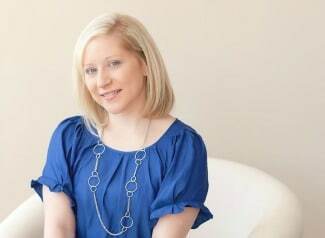 The results were absolutely exquisite, which Sunny S-H Photography captured perfectly! After finalizing the main color scheme, different shades and tones of brass and bronze were brought in to balance it out. One main goal for this styled photo shoot was to have a beautiful and elegant mixture of nature and class. Amanda Douglas Events are huge fans of rectangle tables because there is so much more you can do with the set-up, so rectangle tables were used for the shoot. It’s not as limiting for focusing only on the center of the table and you can bring out the decor and elongate it through the entire table’s length. 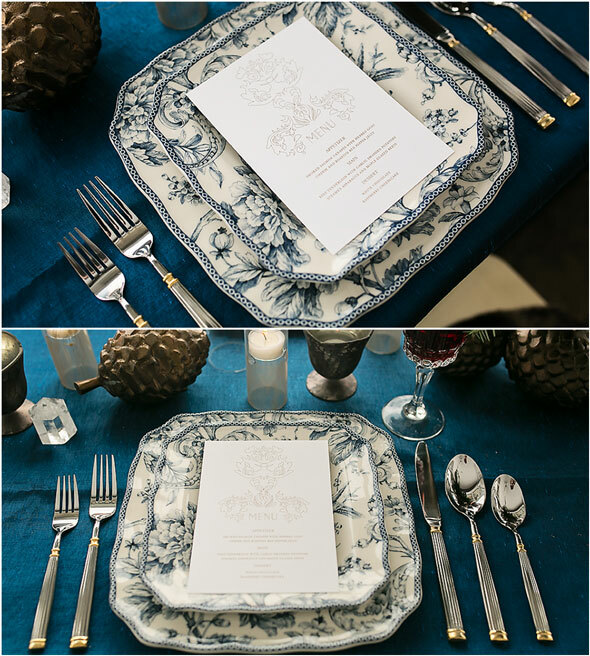 By using different elements, such as multiple heights of the candle holders, the bronze acorns, and the beautifully detailed plates, details were meshed together in a clean design to tie everything together. 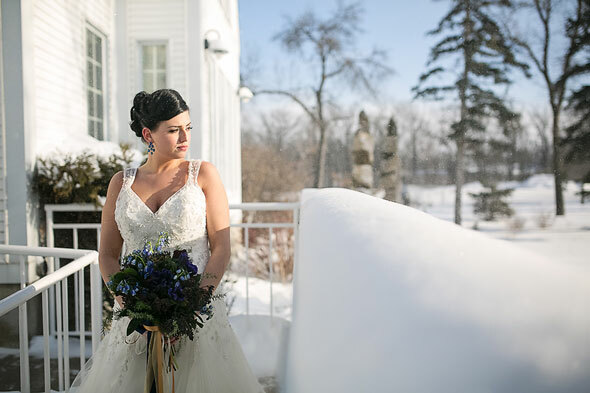 One goal for this winter wedding styled photo shoot was to show what a great example of what a winter wedding could be, without focusing on a holiday theme. 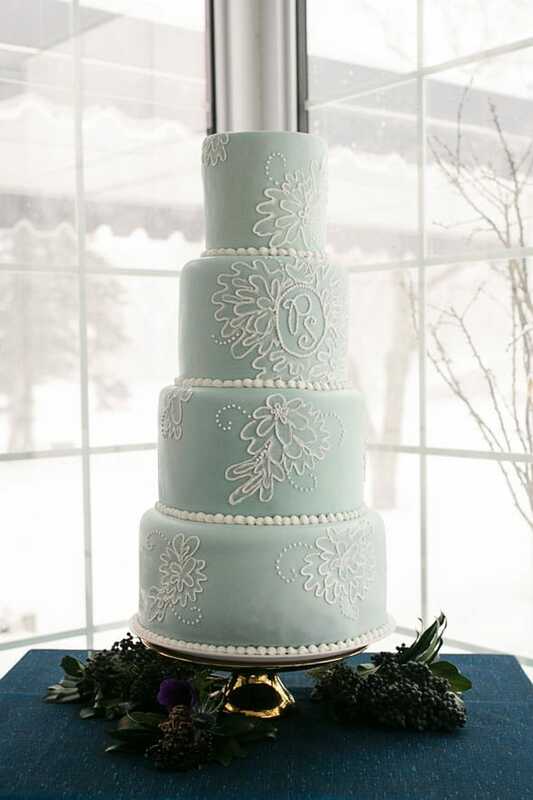 This is a perfect way to showcase a winter wedding that doesn’t have to focus on a Christmas or holiday color scheme! 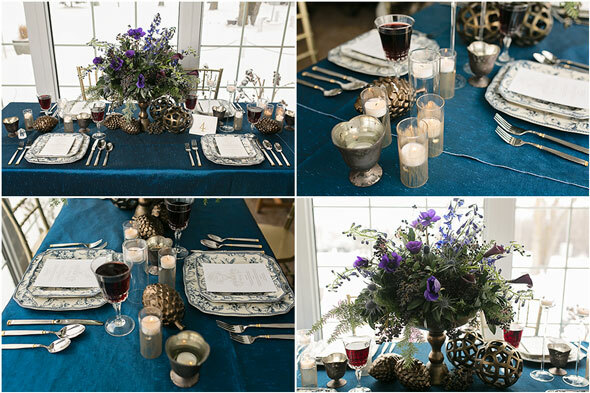 What a gorgeous color palette to take a winter wedding in a different direction from so many examples that are currently out there to view! The bronze details completely bring this gorgeous wedding together and it accents the main color scheme perfectly. 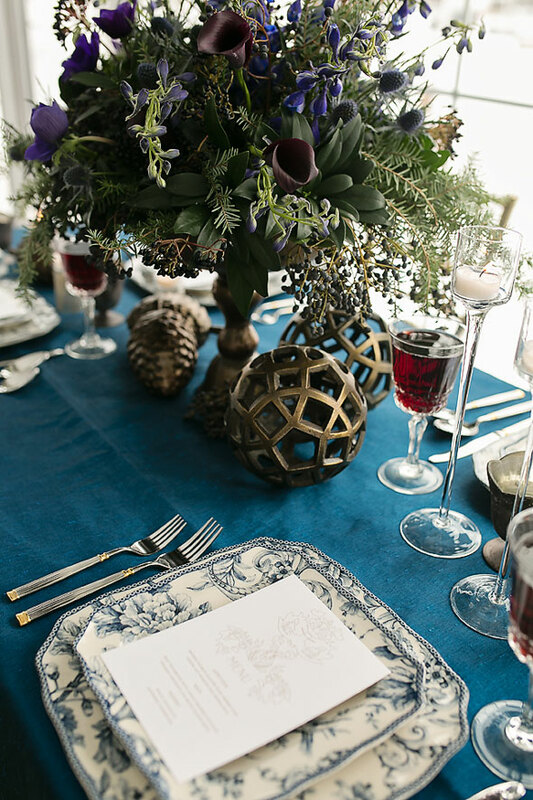 It works so well with the beautiful blues and purples, along with peaks of bronze in the floral arrangements from Oak & Lily. We’re totally smitten! It may be winter, but why not bring in a touch of nature and spring to the table design, as well? By bringing in a little bit of a warm pop, the beautifully detailed floral and bird-patterned plates were a wonderful compliment to all of the other arrangements. 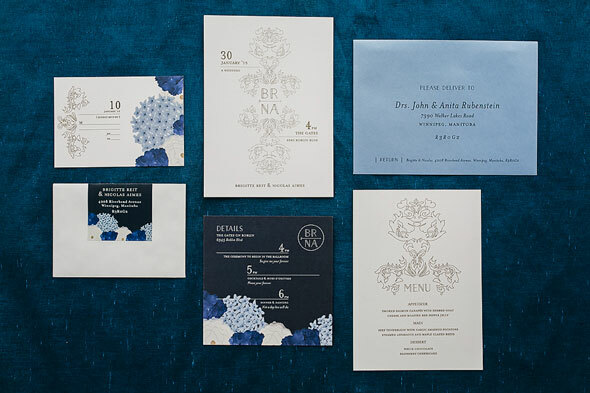 To soften up all of the rich tones seen throughout the photo shoot, touches of ice blue were mixed in throughout the stationary from Robin Egg Blue Design. 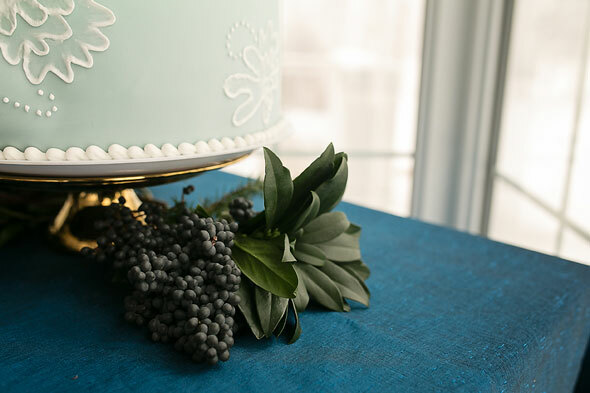 Ice blue was also found in this 4-tiered cake. What a classic cake design provided by Cake-ology! And how about this beautiful bride? 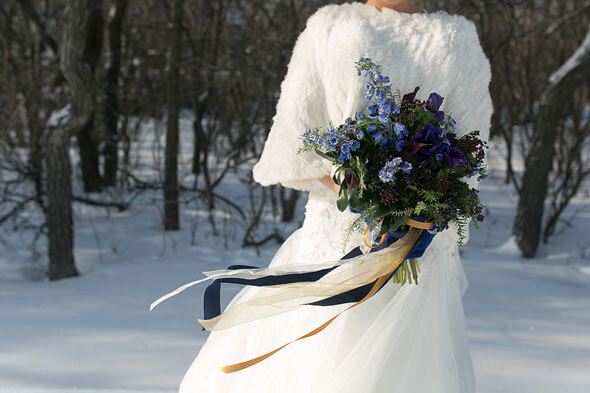 What lovely inspiration for any girl looking to create the perfect winter wedding. Bliss Bridal Boutique provided the elegant wedding dress, with jewelry provided by Amanda Douglas Events. What a gorgeous location for perfect outdoor bridal photos that will be treasured for years to come! 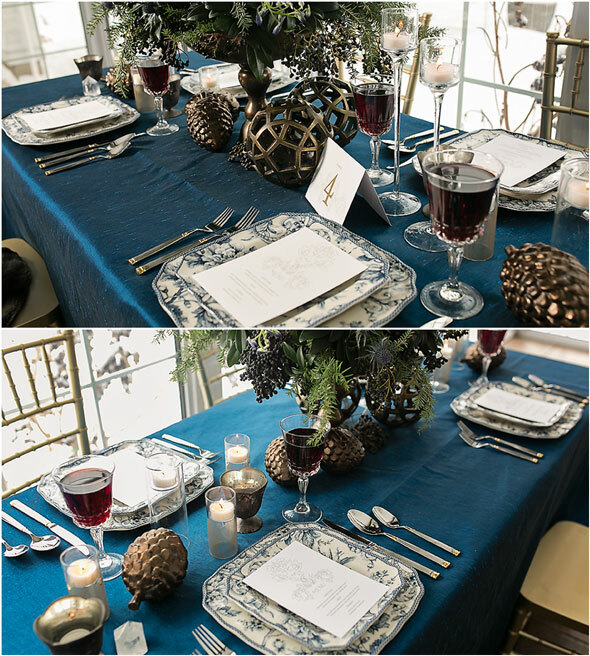 Finally, why just focus this tablescape for a winter wedding or event? This would work well with a woodland-style wedding in the middle of the summer, or even for a barn wedding to chic it up a little bit! Why go with the expected route of burlap and blush pink when you can have these bursts of color around your event? 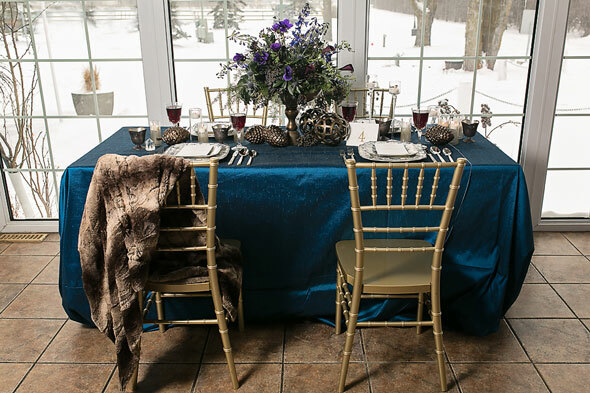 This is the epitome of class and elegance and we couldn’t be more thrilled to bring this inspiration to you for your next winter event! Photography: Sunny S-H Photography // Styling/Design: Amanda Douglas Events // Hair: Hair by Randi // Floral: Oak & Lily // Dress: Bliss Bridal Boutique // Jewelry: Amanda Douglas Events // Cake: Cake-ology // Stationary: Robin Egg Blue Design // Location: The Gates on Roblin // Makeup: 2 Chicks and a Bag of Makeup // Linens/Chairs: Planned Perfectly // Select decor pieces: Weddingstar Inc.
Plan a Winter Wedding with these products! 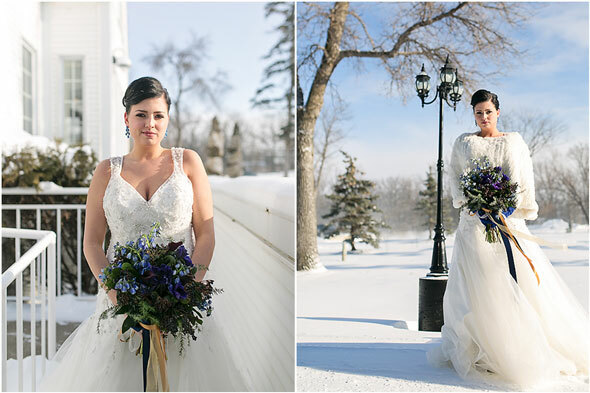 What’s your favorite detail in this Winter Wedding Styled Photo Shoot? Let us know in the comments below! Thanks so much for the featured! We loved getting to put together this photo shoot with a seriously amazing team of vendors!